Border disputes differ for Indonesia, M'sia | Daily Express Online, Sabah, Malaysia. Kota Kinabalu: Indonesia lists 10 land border dispute sites yet to be resolved with Malaysia along the 2,004km land boundary, besides maritime sea boundary disputes.This was disclosed by the Republic of Indonesian Embassy Military Attaché Colonel Yudhi Candra Jaya at the first dialogue organised by the Ikatan Setia Kawan Watawan Malaysia-Indonesia (Iswami) at a leading hotel here, this week. It was moderated by Datuk Dr Chamil Wariya, CEO of the Malaysia Press Institute. "Tan Sri Rais Yatim's address mentioned nine disputes along a boundary of 2,019km. This shows that there is already a dispute difference in the length of land boundary," Yudhi said. Difficulties arise from mapping woes, site conditions, missing boundary markers as well as misunderstanding in the field. "In the case of Tanjung Datu, not disputed any more by Malaysia, the fault lies with the contractor doing the land demarcation work," he said. "Land border demarcation disputes in West Kalimantan and East Kalimantan with the 2,004km borders of Sabah and Sarawak remain unsolved today even as negotiation efforts are ongoing. "Indonesia deems that there are 10 Outstanding Border Problems (OBP) while Malaysia has nine OBP, arising from colonial heritage perception of the interpretations of the Anglo-Dutch Treaties of 1891 and 1915. "As for maritime sea boundary disputes, Malaysia insists on its maritime sea territory based on its declared National Map 1979 while Indonesia rejected the map as incompatible with international laws and principles in determining maritime delimitation based on the United Nations Convention on Law of the Sea (Unclos) that Indonesia recognises. The air space boundary follows the maritime boundary," he said. Both countries share maritime borders with disputes in the Celebes Sea, East Singapore Straits, Tanjung Datu, South China Sea and Exclusive Economic Zone north of the Straits of Malacca. At the dinner table on Monday, when asked, Yudhi likened the past reported naval vessels ramming incident jostling over the Ambalat maritime territorial dispute as youngsters showing off their muscles. Relationship, he assured, since then, as from the days of the Confrontation 1966, has improved through cooperation, training and joint operations. Born in Jakarta on Nov 11, 1965, Yudhi received military academy education and training in Indonesia and had undergone foreign military training in the UK (Young Officer Course 1993), Australia 1997 and US 2006, (Homeland Security 2009), and graduated in international relations. During the dialogue, an Indonesian journalist called for seriousness in resolving the border issues. He alleged that once in Kuala Lumpur, when Indonesian delegates flew in for border dialogue meeting, they were taken to golf courses and shopping malls. When they returned to Indonesia after golfing and shopping, the issues remained pending and unsolved. This led to one proposal that journalists must be part and parcel of any border meeting negotiation process to report on developments for public knowledge. Some journalists also asked why was it rare for leaders from Sabah to visit Kalimantan and vice versa. In fact, leaders hardly even visit Labuan and Sarawak, the other parts of Malaysian Borneo. Amin Anwar, a journalist based in Tawau, decried his experiences of covering border dispute meetings whereby matters were declared off the record. No details were given to the media, questions were stonewalled and instead media personnel were ludicrously asked what did they know, and what would they like to know, from the meetings that transpired behind closed doors. He lambasted the non-transparency "syok sendiri (a local expression for selfish)" outcomes, and the moderator called for being more media savvy on the part of the authorities. 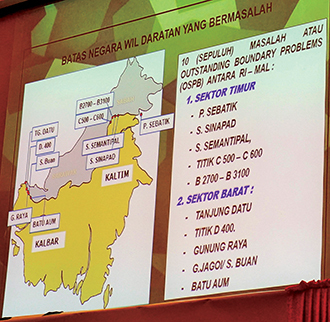 Journalists proposed various solutions from exchange of land, sell off disputed land, to declaring disputed areas as "no man's land" as proposed by the Bernama Chief Datuk Zulkefli Salleh, who is chairman of Iswami Malaysia. One journalist even jested that perhaps such problems were good excuse for them to meet, hence opportune not be solved sooner, or were fated by providence. Another declared that it should be recognised that all disputed lands belong to God, and to leave it in almighty good hands.